Tell your friends about WeekendDating.com via email. You earn 1 point for every friend you refer who visits our site. If 10 friends vist our site, you earn 10 points and you win (see below). The more people you refer, the better your prize. Log in to track how many friends have visited, and how many more need to visit in order for you to earn your reward. The Tell a Friend program rewards you with cash or prizes for sending friends to the WeekendDating.com website. This reward only applies for new individuals who visit the website and is not valid for visits from individuals already on our mailing list. How do I participate in the Tell a Friend Program? It is so easy to participate! Simply start telling your friends using one of the methods below and start earning points towards your reward. Import your address book: Using the same technology as FaceBook, you can import your address book from AOL, Hotmail, GMAIL or Yahoo, and check off who you would like to invite. Click the "invite friends" button and you are done. We DO NOT store your personal information. Tell your friends manually by entering in their email address and then click "invite friends"
How do I know when I have earned rewards? You can check your earned rewards balance by accessing your Tell a Friend Reward Tracker here. Simply enter in your email address and click show details. You will see how many visitors you have sent, and how many more you need to earn your reward. . When I send a referral through this program, how does my friend receive it? 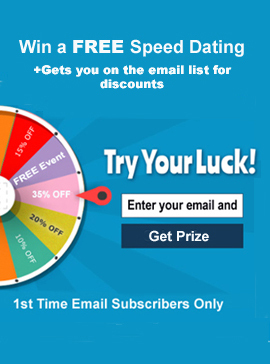 Your friend will receive an email letting them know that you heard about a cool singles events site that offers fun events. That email will have a link for them to click which will take them to our website. In order for you to earn points towards your reward, your friend must click that link. You can track your referrals here. My friend did not receive the referral email. Can I send my friend a second email? Unfortunately not. Our system only allows one (1) email to your friendâ€™s email address. This ensures that noone else has refers your friend at that same email address. If multiple people refer the same individual, only the first referrer of that email would get credit. We are committed to protecting individuals from receiving unwanted emails. By participating in this program, you will be agreeing to the terms of our Anti-Spam Policy. If you violate this policy, you will forfeit any rewards and will not be allowed to participate in the program. For more information, please see our Anti-Spam Policy. If you are a recipient of a Tell a Friend email and feel that you are the victim of Spam abuse, please click here to complete a Contact Us form and inform us of the sender of the email. Does my personal information, and my friends' information, remain private? All of your information remains private and will NEVER be sold, rented or given away to anyone without your expressed permission. You can only sign up one time, using one email. In order to participate, you must live in New York, New Jersey, or Connecticut. We will only make payments or send prizes to these states. All information submitted during participation in the Tell a Friend program must be accurate. Anyone who intentionally provides false information will loose all earned rewards. If WeekendDating.com believes there has been any actual or potential violation of these rules, we reserve the right to immediately terminate you from the program.